Die Martis, 31 Maii, 1642. Arms to a Member's House. THE Report of the Bill for calling the Assembly of Divines was resumed; which was sent down from the Lords, with some Amendments: The which Amendments were twice read. The Amendment of the Time to the First of July was agreed unto, by Vote upon the Question. Mr. Lyford of Sherborne, in Com. Dorset; approved of. Dr. Oldsworth, Master of Emanuell College in Cambridge; approved of. Mr. Carter of Dinton, in Com. Bucks; approved of. Mr. Lance of * ; approved. Mr. Hodges of Kensington; approved. Mr. Perne of Wilby, in Com. Northampton; approved. Dr. Westfield of Great St. Bartholomew's, London; approved of. Dr. Hamon of Penshurst, in Kent; not approved of. Mr. Prophett of Marleborough; approved. Mr. Peter Sterrey of London; approved. Doctor Marshe of St. Dunstan's, West, London, being put to the Question, for his Approbation. Mr. Holles, Tellers for the Noe: 70. Capt. Charles Price, Tellers for the Yea: 71. The Question passed with the Affirmative. Mr. Jo. Erle of Merton College; approved of. Mr. Gibbon of Waltham; approved of. Ordered, That a Conference be desired with the Lords, concerning the Amendments returned from the Lords to the Bill for calling an Assembly of Divines. Sir Ro. Coke, Mr. Peard, Sir Edw. Partheriche, are appointed Managers of this Conference. Mr. Pym informed the House, from the Commissioners for Irish Affairs, That unless ... Hundred and Fifty thousand Pounds were speedily provided, the Affairs of that Kingdom could not be upheld. Ordered, That some Members of this House be sent to the Lord Mayor of London, to desire him to call a Common Hall, to meet upon Thursday next. That a Message be sent to the Lords, to desire that a Committee of some Members of their House may join with some Members of this House, to go to the City, and represent unto them the great Necessities that are at this Time for present Monies; and to inform them what the Sum is required; and what the Security is, upon which it is desired; and to desire, That these Necessities for present Monies may be recommended to the particular Wards of the City. Mr. Holles reports the Conference Yesterday, concerning some Demands to be made to his Majesty: The which were read; being Fourteen in Number. The Lords do conceive, That the Captains and Seamen who have brought the Magazine from Hull, have expressed great Diligence in the Voyage, with much Duty, and good Affections to the Parliament: They do therefore think fit, that this Care of theirs should be taken Notice of, not only by verbal Expressions; but that by some Gratuity, they and others may be encouraged to the same Obedience upon the like Occasions. The Propositions were all read One by One. Resolved, upon the Question, That no Alteration shall be made in the First Proposition. And the First Proposition itself, by Vote, upon the Question, assented unto. The Second Proposition was likewise read; and, by Vote, upon the Question, assented unto. The Third Proposition was likewise particularly read; and, by Vote, upon the Question, assented unto. The Fourth Proposition was likewise read; and, by Vote, upon Question, assented unto. The like was resolved upon the Fifth. The like was resolved upon the Sixth, with the Addition of the Words, "or otherwise." That these Words in the Seventh Proposition, "in such Matters as do conduce to the Suppression of Popery, and Advancement of the Protestant Religion," shall be left out of that Proposition. And then the Proposition, with that Alteration, by Vote, upon the Question, was assented unto; only the Word "Popish Recusants" was ordered to be made "Papists." Ordered, That this Clause shall be added to the Eighth Proposition, "And that your Majesty will be pleased to give your Consent to Laws for the Taking away of Innovations, and Superstitions, and of Pluralities, and against scandalous Ministers." And then the Eighth Proposition, with this Addition, was, by Vote, upon the Question, assented unto. Resolved, upon the Question, That instead of the Ninth Article brought from the Lords, this shall be added; viz. "That his Majesty will be pleased to rest satisfied with that Course, which the Lords and Commons have appointed for ordering the Militia, until the same shall be farther settled by a Bill: And that he will recall his Declarations and Proclamations against the Ordinance made by the Lords and Commons concerning it." The Tenth was likewise read; and, by Vote, upon the Question, assented unto. The Eleventh was likewise read; and, by Vote, upon the Question, assented unto. The like was resolved upon the Twelfth, Thirteenth, and Fourteenth. 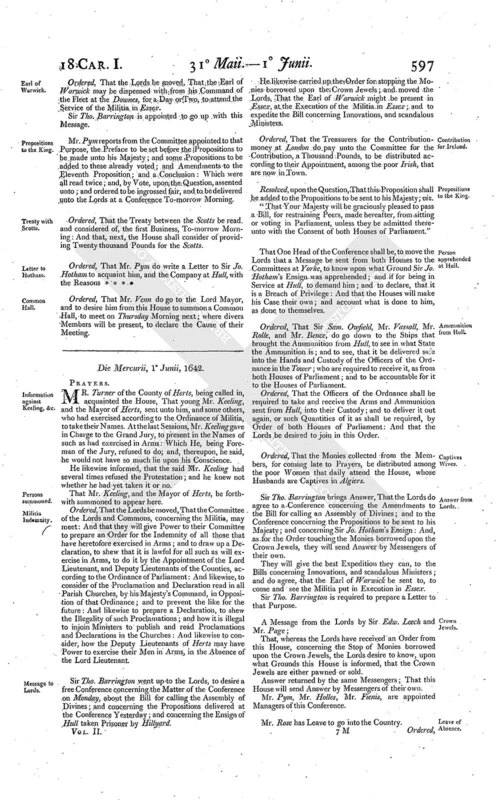 This Committee, or any Three of them, are to take into Consideration the Addition of such Propositions as they shall think necessary to be added to the Propositions sent from the Lords, as well for the Advantage of his Majesty, as for the Advantage of the Subject, according to the Debate of the House: And likewise to prepare a Preamble and Conclusion unto them. This Committee is to take the Information of the Masters of Ships, and others, that lately came from Denmark and Norway, concerning the Preparation of a Navy there; And are to meet at Two of Clock, in the Court of Wards. Ordered, That the Knights and Burgesses that serve for Wales, and Sir Thomas Barrington, shall be added to the Committee appointed to consider of the Spoil done by the Soldiers in Anglesey: And are to meet at Two of Clock this Afternoon, in the Exchequer-chamber. Ordered, That the House meet this Afternoon, at Four of Clock. UPON the humble Petition of certain of the Gentry inhabiting in and near the Parish of Chertsey in the County of Surrey, in behalf of themselves and others; it is Ordered, That Mr. Joseph Boden, an orthodox and painful Divine, late of Widenbury in the County of Chester, shall be recommended by this House, to preach a Weekly Lecture, in the Parish Church of Chertsey aforesaid; that is to say, Every Wednesday, being the Market-day, about Ten of the Clock in the Forenoon, and likewise every Lord's Day, either Morning or Afternoon, when the Minister of the Parish preacheth not himself, nor any other by his Appointment: And the Minister of that Parish is hereby required to permit the said Mr. Boden the free Use of his Pulpit, to preach there accordingly, without Interruption. Ordered, Upon the humble Petition of the Parishioners of Brenchley in the County of Kent: That Mr. Bright, an orthodox Divine, shall be recommended by this House, to be Lecturer to the said Parishioners of Brenchley, to preach there every Tuesday: And the Parson of that Parish is hereby required to permit the said Mr. Bright to preach there accordingly. Ordered, That the like Order be made for a Lecturer to preach there, to the Inhabitants of Pynner in the County of Middlesex, according to their Petition. Ordered, That the like Order be made for Mr. Tho. Porter and Mr. Tho. Langley, Two orthodox Divines, to be recommended to be Lecturers for the City of Chester. Ordered, That the like Order be made for a Lecturer to preach One Day in every Week, in the Parish Church of * in the County of Suffolke. 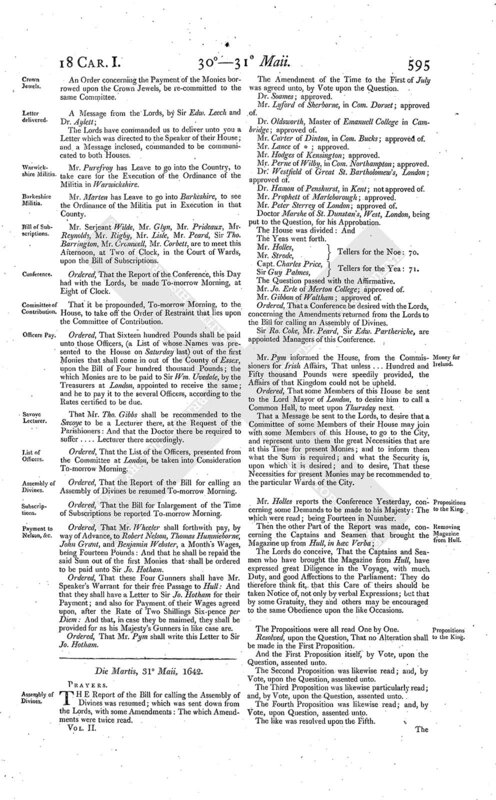 Ordered, That the Deputy Lieutenants for Hampshire, and those Members of this House that serve for that County, and are Deputy Lieutenants for that County, shall go down into Hampshire, to see the Ordinance for the Militia put in Execution: And to return an Account to this House what they have done therein. Ordered, That Mr. Baldwyn shall have Leave to go into the Country. Ordered, That One hundred Pound of the Contribution-money collected at Dover, for the Relief of Ireland, in Spanish Money shall be paid in Specie to the Lord Dungarvan, to be by him sent over to Youghall, in the Province of Munster in the Kingdom of Ireland, to be distributed there, for the Relief of the distressed Protestants that are in that Town, and in great Necessity. Ordered, That Mr. Sutton shall have Leave to send down Ten Musquets to his House in Nottinghamshire, to be employed in the Service of the King and Parliament. Ordered, That Sir Ro. Mansfeild do bring in his Patent for the Making of Glass, by Saturday next, to the Clerk of this House, he having due Notice of this Order. The Lords have appointed us to return you this Answer, That they have agreed to this Order for Raising of additional Forces by Sea, as it was sent up. 1a vice lecta est Billa, An Act for the Draining of the great Level extending itself into the Counties of Northampton, Norfolke, Suffolk, Lincoln, Cambridge, and Huntingdon; and into the Isle of Elye. Ordered, That this Bill shall not be read the Second time, but between Nine and Eleven of the Clock. The List of the Officers, presented from the Committee of Adventurers, was this Day read, One by One; and approved of. Ordered, That the Committee for Adventurers shall meet To-morrow, in the Afternoon, in the Star-chamber: And the Officers now voted are appointed to attend there, and declare, Whether they will accept of their Charges: And the Committee has Power to fill up the Places of such as shall refuse; and to present them to the House for Approbation; and likewise to take into Consideration the Reformadoes. Ordered, That he, and his Petition, be referred to the Committee of Adventurers, to consider of him for a Captain's Place, in this Employment, into Ireland. 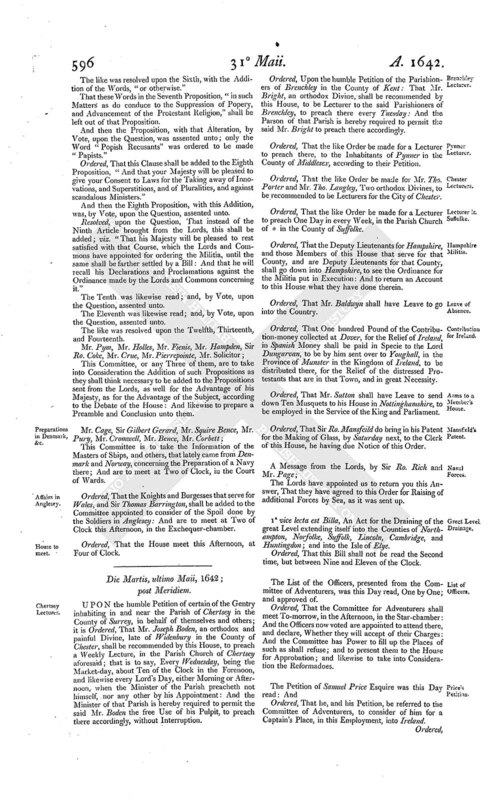 Ordered, That the Lords be moved, That the Earl of Warwick may be dispensed with from his Command of the Fleet at the Downes, for a Day or Two, to attend the Service of the Militia in Essex. Sir Tho. Barrington is appointed to go up with this Message. Mr. Pym reports from the Committee appointed to that Purpose, the Preface to be set before the Propositions to be made unto his Majesty; and some Propositions to be added to these already voted; and Amendments to the Eleventh Proposition; and a Conclusion: Which were all read twice; and, by Vote, upon the Question, assented unto; and ordered to be ingrossed fair, and to be delivered unto the Lords at a Conference To-morrow Morning. Ordered, That the Treaty between the Scotts be read and considered of, the first Business, To-morrow Morning: And that, next, the House shall consider of providing Twenty thousand Pounds for the Scotts. Ordered, That Mr. Venn do go to the Lord Mayor, and to desire him from this House to summon a Common Hall, to meet on Thursday Morning next; where divers Members will be present, to declare the Cause of their Meeting.